Listen to the interview (approx. 1 hr, 2 min.) or download it. Graduated in 2014 with a major in Music Production & Engineering. Principal instrument: guitar. Position: Founder of Barnard Propulsion Systems, a.k.a. 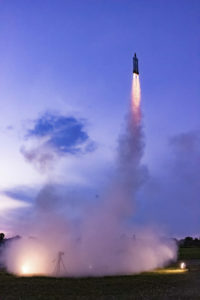 BPS.space, a company that builds and sells technologically sophisticated model rockets in kit form. Unlike other model rockets, these ones steer not via fins, but by controlling the direction of thrust, just like real rockets do. 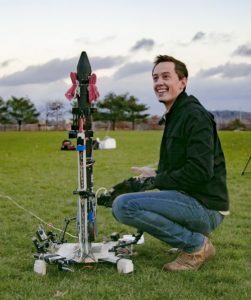 A typical rocket kit sells for around $300, but can be re-used with no engines which are under $20. 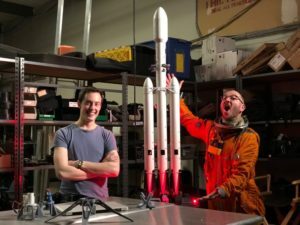 With the company currently a one-person operation, Joe’s current job is around 25% engineering and 75% running the business (communications, sales, and assembling kits). Overview: While at Berklee, Joe met Ben Meyers and was hired by his company, 21 Summit, where he shot many videos and weddings. Joe spent more time doing video than audio by the time he was finishing Berklee, and he continued to work there until the summer of 2016 (2 years after graduation), then started his own video company, where he shot many music videos for Berklee through mid-2017. However, in the fall of 2015 he got interested in SpaceX, and figured a long-term goal was to get a job there. Knowing that his current experience was inadequate to get a job there, Joe purchased many (expensive!) 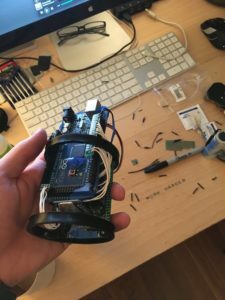 rocketry textbooks, and spent all of his spare time reading and building rockets “The best way I learn is through experience and experimentation.” In March 2017 he figured out his current product. He moved to Nashville that fall, did a few last videos for money, then was able to refine his product and go full-time with his business in early 2018. You can see Joe’s LinkedIn profile here, but the best way to see what he’s up to is by looking at his company website, bps.space. Joe with a friend. “Although I didn’t do it, if you’re starting a company have at least one other person to work with. You won’t have all the strengths and it’s SO hard to start a business, especially during the first few years. You’ll want someone there to go through the experience. . I moved to Nashville because I knew it would be hard, so wanted to be around friends–that’s really important.